Once upon a time, 2 girls greatly enjoyed walking in the rain with Light-Up umbrella. They decided the enjoyment of this experience could be maximized by building their own pressure-activated web of LEDs to install under their Light-Up umbrella. Thus, with the help of an Arduino Light-Up Umbrella, some 4051 multiplexers, a lot of wire and a lot of solder, they set off on their path to success. Just based on size, we decided to use 24 LEDs to light our umbrella, with 8 strands of 3 LEDs each emanating out from the central hub. IMPORTANT: 4051 chips are TRICKY! Take heed! You should keep the schematic handy to reference all the input/output pins and where they need to be connected. You should test out your circuit on a small scale before going crazy with wires and solder. We did this by using 2 bread boards, placing a 4051 multiplexer/demultiplexer in each, and then connected inputs/outputs to the correct places on the Arduino. Once again, refer to the schematic at http://www.arduino.cc/playground/Learning/4051. Attach the two Vcc inputs (pin 16) to the shared 5 V source of your Arduino. Attach E (pin 6), Vee (pin 7), GND (pin 8) of both chips to the shared ground of your Arduino. Attach z (pin 3) to an Analog In of your Arduino. If you use our exact code, attach the chip with the piezos to A5, and the chip with LEDs to A0. 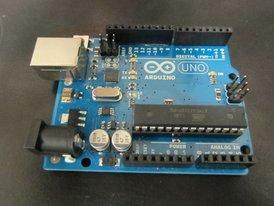 Attach S0 (pin 11), S1 (pin 10), S2 (pin 9) to Digital Outputs on your Arduino. Once again, if you use our exact code, attach the chip with piezos to 2, 3, and 4, and the chip with LEDs to 8, 9, 10. Ok! Now that you have a crazy mess of wires, you should connect your components to the remaining pins. 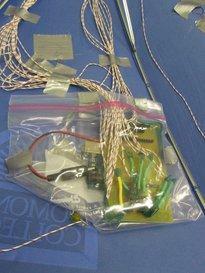 At first, we just wanted to make sure it worked, so we only hooked up 2 piezo sensors and 2 strings of LEDs. These go in any of the remaining I/O pins on the 4051. ***You should hook up the LED string to the same numbered pin on the 4051 as the pin its respective piezo disk is hooked up to. CAUTION: When we were trying to test this, we encountered some random, sporadic data. Then, we hooked up all our floating pins of the 4051 to ground, and everything worked fine. We’re not quite sure why, when the pins aren’t connected to anything, they give off random readings, but, in any case, connect every pin you’re not using to GROUND. Now, uploading and running the Arduino code, you should be able to tap the piezo disks and then see numbers on the serial monitor, as well as see the respective LEDs lighting up. 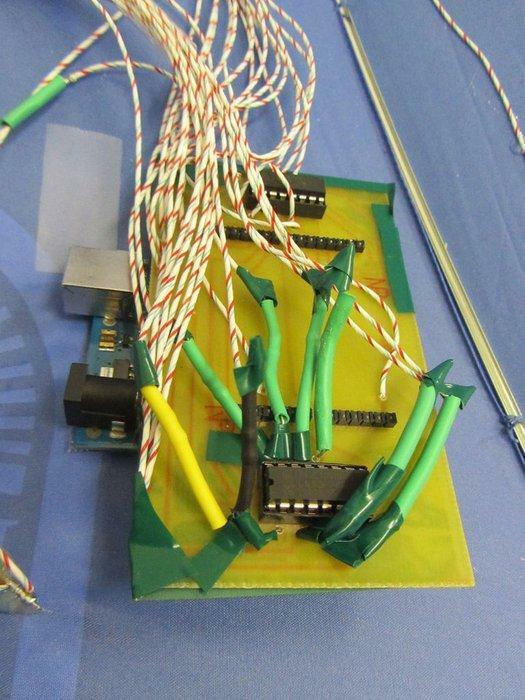 This step is not extremely necessary, if you don’t have the facilities to do it, but it is VERY helpful to make a printed circuit board instead of working with the mess of wires and breadboards from the mock-up. Using EAGLE software, we designed our own circuit board. Here’s our schematic and board layout. We then printed this, cut it out, drilled holes, and attached pins to attach our board to the Arduino. The final product is really exciting and compact. So much better than the mess of breadboards, right? NOTE: Before soldering lots and lots of wire to everything, you should measure how much wire you need. As in, figure out where you want to place your sensors and LEDs inside the actual umbrella, and how much wire you’ll need to connect them to make it there. Piezo disks in parallel with 10 MΩ resistors. 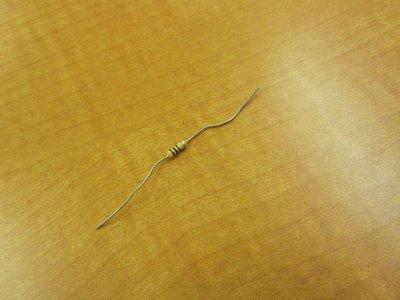 Wire to one side of resistor and pin of 4051. Wire to other side of resistor and shared ground. ***Our piezo disks were really fragile. More like, the wires that came attached to them were really fragile and broke on us a few times. You should reinforce them with electrical tape. 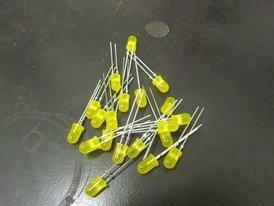 Resistors to pins of 4051 associated with LEDs. Wire to resistors and LEDs. End of LED string to shared ground. I know you’ve been thinking “I thought this was a light-up umbrella, and I haven’t even seen the umbrella referenced!” Well, impatient you, now is the time. Break out your umbrella. This requires a lot of opening umbrellas indoors, so I’m sorry if you believe this gives you bad luck. You do this at your own risk. Open your umbrella, plug in your glue gun, and figure out where you want everything to be attached. Don’t forget that you need to power your Arduino with a 9 V battery, and so you’ll need somewhere to put that in your umbrella as well. Then, have at it. Be careful not to melt any components, or the umbrella, with the hot glue. Also, it is helpful to hold things in place with tape while you solder. Ordinary scotch tape didn’t like to stick to our umbrella, so we ended up getting frustrated and then choosing packaging tape and duct tape, which both worked much better. ***HINT: we spread out and glued all the piezo disks first, and then turned on the Arduino, tapped the sensors, and figured out what string of LEDs corresponded, so we could attach them to the correct panel. This is IMPORTANT. Just for ease of organizing the wires, we fed each of them from the Arduino up to the top central hub/peak of the umbrella, and then out to their respective panels. The wires get pretty messy, so we suggest taping them together and gluing them down at strategic locations so the wire doesn’t get tangled or fall off. This is something we hadn’t quite anticipated, but, after running into some difficulties, realized that we desperately needed to put electrical tape on all exposed wires, so as to prevent interference between randomly touching wires. So, we wrapped all exposed wires near each other with electrical tape as well as the soldered connection on the bottom of our shield. Our battery was previously touching some of the soldered areas, causing interference, but all we needed to do was cover the connections with electrical tape, THEN attach the 9 V battery, and we were good to go! We then placed the Arduino, shield, and battery in a plastic bag to semi-waterproof it. We took this pouch and attached it to our umbrella with a ridiculous amount of duct tape. You may or may not be able to close and open your umbrella at this point, but unless you just got really angry and stabbed it, it should be usable in the rain. Just to be safe, you should wipe off excess rain before closing and storing it so that water doesn’t get into the inside and fry any of your components. If we had more time, we would’ve sewn a layer of plastic sheeting over all our components. Now, wait for the rain, and go show off the BEST thing ever that will make all the neighbors jealous (especially at night). Yay!